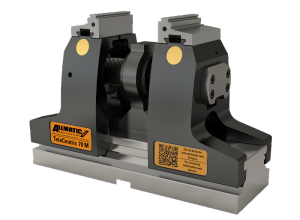 With its TeleCentric, the clamping device specialist ALLMATIC-Jakob presents a novel centric 5-axis clamping device with a standard fast attachment bracket system. secure and newly designed solution for clamping on modern 5-axis machines. Both grip clamping as well as conventional clamping are possible. accessibility of the machine spindles and the workpiece. Thanks to the centric functionality, there is not zero offset and the material allowance can simply be divided in two because it is fixed symmetrically. Stating the reason for this decision of the designers by saying, the expert says, “The parallel positioning of the workpiece ensures the highest possible clamping accuracy at a maximum loading force of 30 Kilo newton and rather operator-friendly 45 Newton metres at the dynamometric key.” This is the loading force that the TeleCentric brings to the workpiece – thanks to its new lubrication-free telescopic spindle. solution? Simply turn the brackets around or provide longer ones. 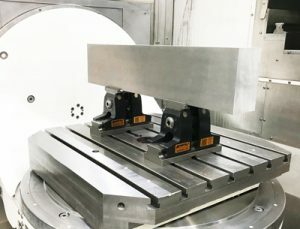 The TeleCentric meets all requirements that one could have of a machine vice used in today’s 5- axis machining world. With this ALLMATIC product, it doesn’t even take ten seconds to change a pair of brackets, no need for tools, either. 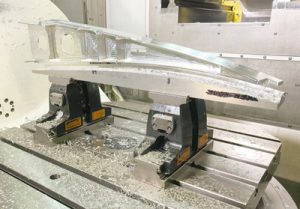 Workpieces are placed at a height of 192 millimetres. Even the weight of the TeleCentric is anything but usual: Depending on the model, and without the brackets, it weighs no more than 19.5 kilograms and thus makes it possible to optimize the production process, while guaranteeing great operator convenience in manufacturing plants.